Alliance is a gospel-centered church that gathers for worship, studies God’s Word, and impacts communities through service in Boone and around the world. Our Sunday morning Worship Services begin at 8:15, 9:45, & 11:15 AM. On your first visit, make sure to look for the “New To Alliance” signs to meet with one of our Sunday morning hosts. They can answer any questions and help point you in the right direction. 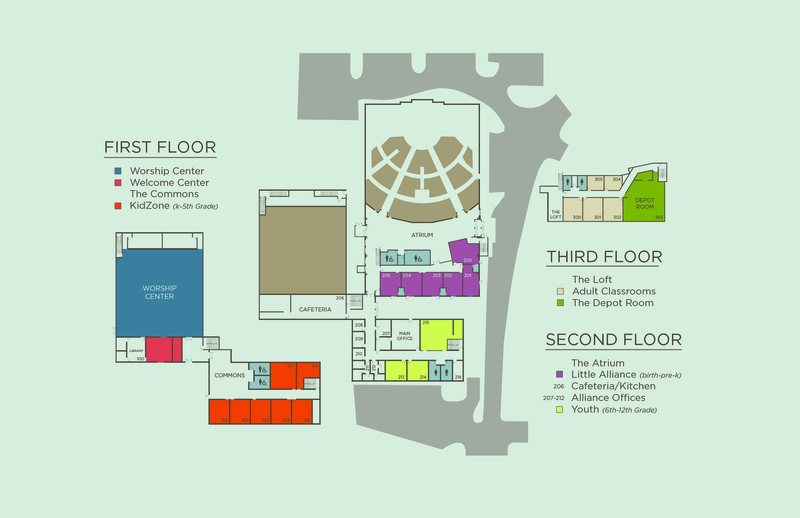 CLICK HERE to download a facility map. You’ll notice we have no dress code. You’ll see a wide variety of attire from relatively dressy to very casual. Just come as you are. We just want you to be comfortable. Our church family is as diverse as our style of dress. We are a culturally relevant, multi-ethnic, and multi-generational congregation that shares a love for God and people. Our services are about 80 minutes long and include a dynamic time of singing together using a blend of music styles and teaching verse by verse through the Bible. If you can’t visit in person, you can browse our SERMON LIBRARY or access sermons on-demand by subscribing to the podcast in the iTunes store. If you have any questions, feel free to let us know. If you’ve been checking us out and want to know more, we offer Explore Alliance. This six-week class covers core beliefs, church structure, expression, and ministry opportunities, with a sixth week for those who want to become members. Alliance also offers teaching and worship for kids of all ages every weekend.